Our primary focus at Optimum7 is to provide clients with unique eCommerce and Digital Marketing solutions that can grow their online businesses. Technology is constantly evolving and out-of-the-box hosting solutions simply cannot keep up with the rapid changes. Consequently, this limits the growth potential of online businesses and it is the reason why Optimum7 offers custom programming and eCommerce development solutions that are tailored to the specific needs of our clients. Whatever your business needs to prosper, whether it is custom programming, web design, or marketing solutions like SEO and Content Marketing, Optimum7 can deliver. Custom programming, development, and functionality require careful planning, strategy, and execution. Optimum7 is behind the creation of hundreds of functionality projects that are specific to the BigCommerce platform. Optimum7’s top BigCommerce functionalities include: Advanced Search, Advanced Filter, Pre-Checkout Upsell, Monogram/Swatch Integrations, Age Verification, Sticky Checkout, and Abandoned Cart Email Follow Up, in addition to many more. Stop wishing that your eCommerce store was better. With Optimum7, you can make whatever you need to happen, happen. If there is any functionality or application that you cannot find on the BigCommerce platform, then contact Optimum7 today and we can make it for you. First impressions are 94% design-related. Complex designs, such as busy layouts, lack of navigational aids, slow load speeds, and pop-ups, can turn people off when they visit a company’s website and, consequently, people are less likely to explore beyond the website’s homepage. Creating effective web design is more than making pretty websites. It’s all about creating something that is appealing to customers so revenues will rise. This typically comes right down to usability. How well can a company’s customers use the company’s website? Optimum7’s team is prepared to transform your BigCommerce website into something that your customers won’t be able to resist. Check us out today. Custom programming can be a lot of different things, but a basic description of Custom Programming is any web-based process or functionality that helps businesses run more efficiently and increase profitability. Optimum7 is prepared to help your business grow and we can do it by resolving whatever technical issues you’re having. By increasing conversion rates for your business, Optimum7 can increase your company’s topline growth sales. By saving money on labor and shipping costs, and enhancing productivity (like integrating central business systems), Optimum7 can positively alter your company’s bottom line growth, as well. Is technology limiting your company’s progress? Talk to Optimum7’s team of BigCommerce experts today. Our team can re-establish your business’ online infrastructure and give it a strong foundation for continual growth. The competition for online business is fierce. Did you know that 75% of people browsing Google and other search engine sites don’t scroll past the first page of results? There are 10 search results listed on each page and it’s easy to see why it can be difficult for small and medium-sized businesses to compete with large corporations online. Businesses that operate online must be visible to the people who buy products and services from them to be successful. It’s as simple as that. Using SEO and Content Marketing, Optimum7 can make this happen for your business, regardless of the corporation’s size. Our main priority with SEO and Content Marketing is to establish trustworthy relationships between clients and their customers. We do this by creating informative, consistent, and useful content. Additionally, the content Optimum7 creates makes it easier for consumers to find our clients’ businesses online. SEO and Content Marketing is a game that Optimum7 has mastered and we can help you master it too. Sponsored Search strategies provide instant results that SEO and Content Marketing are typically unable to do quickly. Pay-Per-Click (PPC) is fueled by data, which means Optimum7 can continuously test, measure, and refine the PPC campaigns we start for our clients in order to maximize traffic, leads, and revenue. Meanwhile, your business’ long-term strategy, which includes SEO and Content Marketing, is gradually taking hold. Optimum7’s strategies for Sponsored Search are designed to meet consumers on their level and meet your company’s specific objectives. By researching the competitive landscape, Optimum7 identifies the market gaps that are in relation to your business and your business can take advantage of these gaps to create a stronger awareness of your company’s brand. Video is one of the most effective ways businesses can increase visibility, improve brand engagement, and generate more sales. It’s an easy way for businesses to connect with existing customers and attract the attention of new customers, as well. 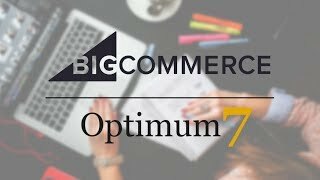 Optimum7’s BigCommerce Video Production and Editing service can deliver unmatched conversion rates for your online business today. The types of video packages our team currently offers include: Promotional Product Videos, Company Story Videos, Informational Product Videos, Live Event/Speaker Engagement Videos, and more. Optimum7’s team of program developers has decades of experience conducting error-free automated migrations that successfully export all products images, descriptions, customer orders, contact information and other important data onto BigCommerce’s platform. Our team also has the means to build customized functionalities that will give buyers a more pleasant and memorable shopping experience that could turn them into recurring customers. Some of the services Optimum7 provides would be nowhere without high quality content. That’s why our copywriting department is crucial to a lot of what we do here. Optimum7’s SEO and Content Marketing service, for example, wouldn’t work without a reliable and consistent source of interesting and unique content. Sure, Google algorithms rely on keywords and data reports to pull relevant information from around the web, but Google also takes into account what web users think. For instance, did you know that Google measures “human signals” to indicate how well readers are engaging with the content on websites? How readers engage with a website’s content strongly influences how the website’s pages rank in search results. Optimum7 provides clients who have BigCommerce websites with copy that has substance. The content created by our team reflects specifically what your business is, how you’re different, and everything consumers need to know about the products and services your company offers. In turn, your company’s website ranks higher in search results and a higher number of consumers are introduced to your business and encouraged to buy from you. Email marketing is still a viable strategy, but creating the kinds of emails that people simply cannot ignore takes skill. Nearly a decade of experience testing what works and what doesn’t has gone into Optimum7’s email and newsletter marketing strategies. To maximize conversions for your business, Optimum7’s marketing team creates specific email templates for every stage of the sales funnel. These templates are sent to your company’s subscribers at predetermined intervals of time and everything in relation to the campaigns is tracked by Optimum7’s team. We keep a close eye on open rate, click-through rate, conversion rate, conversion per click, cost per click, and more. We’ll help you get set up, track your success, and optimize everything so you have another reliable source of leads and sales. Why are you in business? What are your short and long term goals? What is your plan for growth? Who are your customers? How can we help? These are the questions we ask our clients. Before we can make the services we offer valuable to you and profitable for your business, we have to know where you are and where you want to go. Only when we understand you and your business on this deeper level can we determine exactly what we need to do to provide real and tangible results. Full Service Whether you need someone to assess your marketing plan, offer advice about ways to increase your online visibility or how to improve your eCommerce store, we can provide the guidance and expertise you need. And while consultation is a fundamental aspect of all our client relationships, the majority of our clients actually hire us to create and carry out their online marketing strategies or build them a custom website. We don’t hire commissioned sales people. If you’re interested in our services, the first people you’ll speak with are our two owner-executives. Why? Because it’s essential that we tell you what you need to know, even if it may not be what you want to hear. A traditional sales approach does not lend itself to this kind of transparency. It’s clients, not sales, that drives us. Passion We treat your business as if it were our own. We don’t want to do busywork. We want to help you make real changes and improvements that grow your business. We’re copywriters, marketers, programmers, designers and developers. We’re passionate about our work because we’re doing what we love every day and we want you to get fired up about it, too. You can pay for a service, but you can never buy motivation, dedication, leadership or passion. Form a multi-channel, fully-integrated marketing strategy that combines different methods to create a roadmap to goal attainment. With clearly defined goals and KPIs, you’ll know which tactics will achieve the highest ROI for your business. Your website can be a 24/7 cash cow and your most valuable sales asset! Optimum7 is a full-service digital marketing agency and technology company whose team of in-house marketers, developers, strategists, and writers are with you every step of the way from strategy, to development, to marketing and content creation. Our web marketing services improve your company’s business and make money for you! Search Engine Optimization (SEO) is the on-going process of improving the visibility of a website or web page in the organic search engine results presented in Google and other search engines. SEO focuses on growing what is known as organic traffic, which refers to traffic achieved through search engines rather than paid advertisements. Organic traffic is widely considered much more valuable than paid traffic as organic traffic is overall proven to more likely result in a conversion. “Content is King.” Research has shown that the more of your content a user consumes, the more likely they are to make a purchase or use your services. Our in-house staff of designers, copywriters, and strategists can create a content strategy for you that will engage your audience and build trust. Paid Search, also known as Pay-Per-Click or PPC, is a form of online advertising in which businesses create sponsored listings on search engines, such as Google, or other sites such as Facebook or Linkedin. Under this model, advertisers pay the host site a fee every time their link is clicked. Optimum7 and our in-house team of developers and designers have been providing eCommerce development services for over 12 years. At Optimum7, we have a specialized team of BigCommerce developers to create any custom features you may want and to bring your company’s vision to life while increasing visibility and revenue. Optimum7’s team of program developers will conduct an automated, error-free migration that will successfully export all of your products’ images, descriptions, customer orders, contact information and other important data onto your BigCommerce platform. We also have the means to build customized functionalities that will give your shoppers a more pleasant and memorable experience that could turn them into loyal recurring customers. Perform the migration from Shopify to BigCommerce with Optimum7 and let us help you optimize an eCommerce store that works for your business and your customers. Our migration services help store owners turn around their business and unlock the full potential of their online stores. 9 Functionalities to Help Increase Conversions & Sales on Your BigCommerce Site. Check out these 9 Custom Functionalities that Will Help Increase Conversions and Sales: Advanced Search, Advanced Filter, Pre-Checkout Up-Sell, My Account Re-Order, Complete Customer Source Tracker, Custom Monogram & Swatch, Custom Product Page, Age Verification, and Add All to Cart. 5 BigCommerce Functionalities to Improve your Online Store! BigCommerce + Optimum7 Check out these 5 BigCommerce Functionalities that can help you Improve your eCommerce site! Recent Purchase Notification, Digital Signature, Year / Make / Model Product Search, Product Image Watermark, and Registry System.